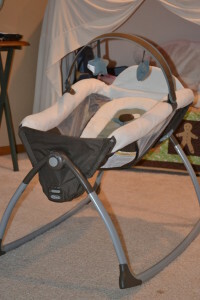 Graco Little Lounger | A Savings WOW! This is a sponsored post. Although this post is sponsored, all opinions are our own, honest opinions. A few days ago, I had the opportunity to check out one of the newest baby products, the Graco Little Lounger, hosted by Baby Dickey. We used Graco products for all four of our children when they were babies, so I was very interested to learn about how they are making mom’s lives easier with the Graco Little Lounger. Little Lounger™ is two products in one: a rocking seat and a vibrating lounger. In rocking seat mode, calm baby with the gentle back and forth motion of the rocking seat. Then, flip down the Rock Locks™ and the seat becomes a vibrating lounger with 2-speed vibration. The ingenious seat has multiple recline positions, so that it’s easy to find just the right position for baby’s comfort. When you’re not using it, Little Lounger folds compactly to store or travel, and a cute toy bar will keep baby occupied. My friend had one of these and she said they are the BEST!